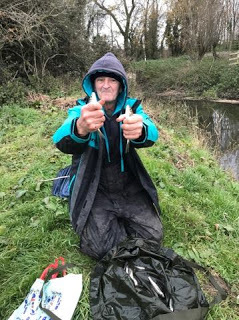 Before I get on to this weeks blog I would like to pay my respects to Bob Hammond who passed away recently, he fished with both Ilminster and Chard clubs and his very dry sense of humour will be missed by many, rest in peace mate. 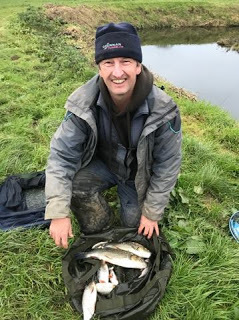 After several hard frosts, I thought it could be hard going today and when I swap my faithful Bait-Tech baseball cap for my Drennan fleece hat, I know winter has arrived! With Hurf not fishing again this week, it was down to me and Steve P to arrange the match and I have to say it’s a bloody nightmare, everybody has an opinion on what pegs should and shouldn’t be in, I’ve said it loads of times on the blog, match organisers deserve a medal as it’s a thankless task and there is no way I could do it every week. I must admit I do worry about the future of the clubs match fishing, we’re getting healthier turnouts than we have for years and there’s a great bunch of lads that want to fish every week but it’s a huge commitment running the matches and people have busy lives these days, I certainly can’t devote enough time to do it every week and I do fear it will just fizzle out which would be a massive shame for the club but that seems to be the way it’s going. Anyway, onto this weeks match, after much debate, the pegs decided on were at Redbridge and Isle Brewers and with Hambridge not being used (where the winner came from last week), I knew peg 120 would take some beating, I also really fancied peg 110. As I was holding the bucket I could see what everybody had drawn, Baz pulled out the peg everyone wanted but the first thing he said was ‘Bloody long walk!’, I think most people would have happily swapped mate! Young Stuart drew 110, Rob was on 108, John D had 126, Frank was on 128 with Bill on 128a, Karl on 129 and Adie on 127. I had the last ball which was 124 and I must admit to feeling a little deflated as it hasn’t been great, I had the choice of that one or 124a and decided on the latter as it can throw up a big weight, although normally with some colour on it. I got to the river and as I was unloading the car, Adie said 127 looked nice despite the river being low and clear, I dropped my kit off on peg 124a before checking out 124 as well, if anything it looked the better peg but I decided to stick with my original choice. Steve P was below me on 125 so I would be able to keep an eye on my pound and Jake was up on 123. 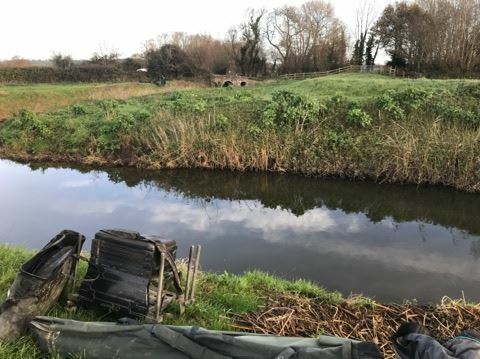 I managed to get my box in although I was sat quite high off the water, while I was setting up several fish topped below me on the bend and above me in the shallow water which got me thinking I could be in for a good day. I set up two rigs, a 1 gram bodied float to fish the deeper water in the middle of the peg and a 0.6 gram DH16 for fishing across and down the peg in the shallower water, on the side tray I had maggots, casters and Bait-Tech Super Seed hemp. I was just about ready in time and started with single caster in the deeper water at about seven metres, I started getting bites but only from minnows so I tried near the top of the peg and a decent bite resulted in a little gudgeon but it certainly wasn’t the start I’d hoped for. I had a little dace and small roach but minnows were already being a pain, a quick shout down to Steve and he said he was struggling too. 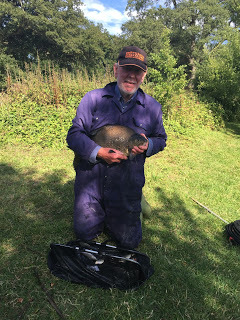 I stuck on another section to fish slightly further down the peg, I held back, the float sunk from view and a nice roach flashed in the clear water, I shipped back gently only for it to come off! 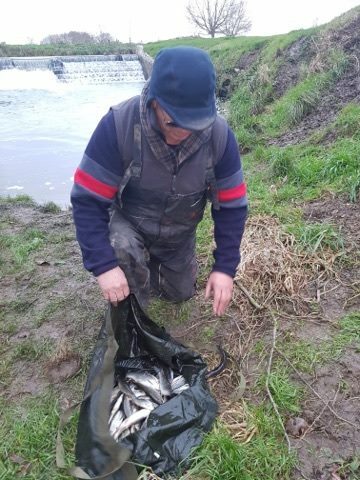 I was feeding casters and hemp at the top of the peg plus feeding casters across and flicking a few down the peg as well, hopefully to bring those fish up the swim. 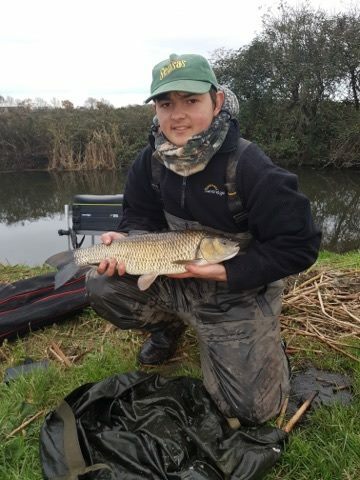 After the first hour, I only had a few ounces in the net but there are usually a few chub about in this swim and as I thought 5-6lb would be a decent weight today, it would only take a couple of fish and they could show up at any time. 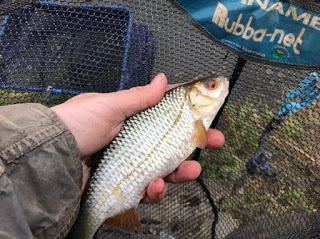 I put another section on to search further down the peg and a good bite resulted in another good roach nodding it’s head, I safely netted this one and it was a decent fish of 4-6oz, next chuck I had another but any thoughts of bagging up disappeared when I went a further ten minutes without a bite. I laid the rig in further across, where it was shallower and the float didn’t even settle and slid across the surface, I struck and I hooked what felt like a better fish but as I shipped back it came off and I’ve got a sneaking suspicion that as I laid the rig in, it went over a fish and I foul hooked it. Jake wandered down and said all he could catch was minnows, even if he put a worm on, while he was with me I had a couple of minnows and a gudgeon but it looked like it was going to be a real struggle. As the match passed the halfway mark (we were only fishing five hours today), I probably only had a pound or so in the net and had to try something else. There were still fish topping down the peg so I picked up the shallower rig with the intention of having a go for them at 13 metres but first I tried over by the far bank and to my surprise, the float settled and then buried and the strike resulted in solid resistance as a fair bit of blue hydro showed itself. 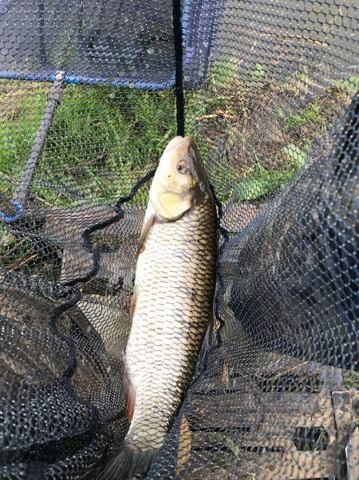 I shipped back so the fish was in the middle of the peg, I could see it was a decent chub and thankfully it didn’t give me too much trouble and I slipped the net under a two pounder. I went back over and a few minutes later another good bite resulted in a decent roach around 8oz and it felt like there were a lot of fish there, they were just wary of feeding in the gin clear water. Steve wandered up and said he was thinking of having an early bath, I told him to stick at it as it wouldn’t take a lot to get in the money today. Over the next hour or so, I added a few more minnows and a couple of tiny dace but I thought I needed another chub or two to do well today. 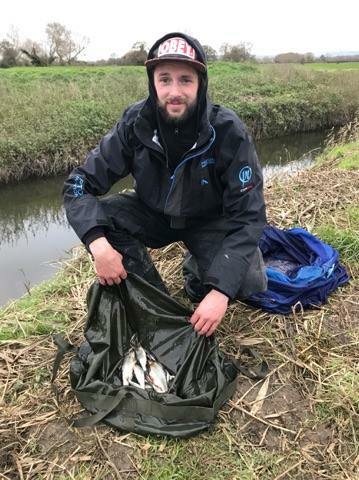 Going into the last hour, there were still small fish topping above and below me so I stuck the pole 10 metres upstream where it was only about a foot deep, the float went under and I had a little roach, three more followed before they wised up to that. With only about ten minutes left, I decided to go back across by the far bank in search of another chub, time was ticking by and then the float sailed away and the strike resulted in a decent fish ripping the elastic out. I stuck the pole under the water, hoping the fish wouldn’t find the sanctuary of the far bank cover and shipped back. I lifted the pole and it was in the middle of the peg, it was a slightly smaller chub but much more feisty and I have to admit, I had butterflies as it went into the landing net. I didn’t have time to go in again and shouted the all out. I packed up and as Jake had the scales, I walked up to weigh him in, he had a few dace plus loads of minnows for 1lb 7oz, I was next and I was pleased when the needle settled on 5lb 12oz, Steve had started to get a few fish late and when he pulled his net out it was close between him and Jake but he fell just short with 1lb 6oz. We took our kit back to the cars and as the others started arriving back, it had been really hard below the bridge as well, John D had the top weight there with 4lb 1oz from 126 followed by Frank with 1lb 10oz from 128, Adie with 1lb 7oz from 127, Karl with 1lb 5oz from 129 and Bill on 128a didn’t weigh. 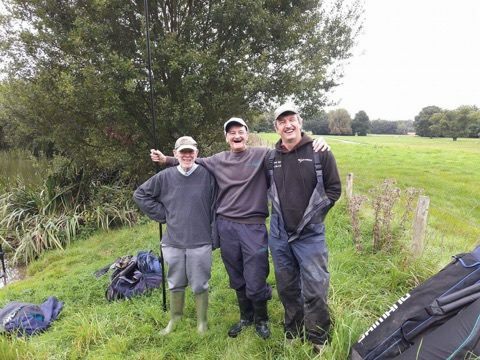 So I was still leading but there were still the Redbridge pegs to come and I knew Baz would beat my weight in 120 and apparently Stuart had landed a good chub early. We’ve now had seven different winners so far with Frank Woodard the only angler to win more than one match. Next week it’s the Xmas Fayre and with over twenty anglers booked in, I thought it would be the ideal opportunity to try a few different areas of the river but the decision has been made to fish the pond and the canal. I can understand it makes it easier to organise but with the temperature set to plummet over the next few days, I think it will be rock hard, I hope I’m wrong. I’d quite fancy giving the canal a go as I haven’t fished it for ages so that’s bound to mean I draw out the pond!